Editor-in-Chief Dr. Qian Sun, University of Texas Medical Branch, USA. International Journal of Nursing the official international research journal of American Research Institute for Policy Development. The journal provides a forum for original research and scholarship about health care delivery, organization, management, workforce, policy and research methods relevant to nursing, midwifery and other health related professions. It aims to support evidence informed policy and practice by publishing research, systematic and other scholarly reviews, critical discussion, and commentary of the highest standard. 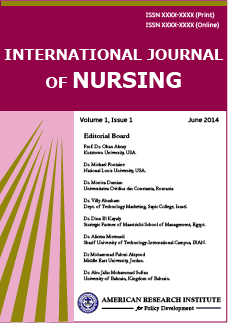 International Journal of Nursing particularly welcomes studies that aim to evaluate and understand complex health care interventions and health policies and which employ the most rigorous designs and methods appropriate for the research question of interest. The journal also seeks to advance the quality of research by publishing methodological papers introducing or elaborating on analytic techniques, measures, and research methods. The journal has been publishing original peer-reviewed articles of interest to the international health care community since its inception. The journal follows double-blind peer review process. Each paper published in International Journal of Nursing is assigned a DOI®number, which appears beneath the author's affiliation in the published paper. Click HERE to know what is DOI (Digital Object Identifier)? Click HERE to retrieve Digital Object Identifiers (DOIs) for journal articles, books, and chapters. Dr. Qian Sun, University of Texas, Medical Branch, USA. Dr. Chalida Thanattheerakul, Department of Pediatric Nursing, Khon Kaen University, Thailand. Dr. Nuriye Büyükkayacı Duman, Department of Nursing, Hitit University, Turkey. Ozum ERKIN BALYACI, Dept. of Public Health Nursing, Ege University, Turkey. Dr. Şükran ÖZKAHRAMAN, Dept. of Public Health Nursing, Suleyman Demirel University, Turkey. Dr. Belal M. Hijji, Faculty of Nursing, University of Benghazi, Benghazi, Libya. Dr. Amir Sadeghi, Department of Nursing Education, Hamedan University of Medical Sciences, Iran.